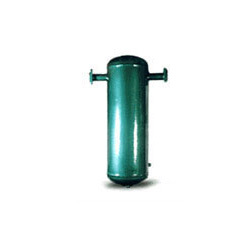 Oil Separators are made from Carbon Steel shell and carbon steel dished ends. Shells upto 300 mm (12″) are made from seamless/welded pipes and above 300 mm. they are made from rolled plates. All oil separators are manufactured and tested as per the following standards. Two types of oil separators are available. One with automatic oil return and other without automatic oil return. The diameters vary from 200 mm(8″) to 600mm (24″) and lengths vary from 1 metre(3′) to 1.5 Meter(5′). Custom built, oil separators can also be made as per customers requirement.